Located in the southeastern part of Asia, Cambodia was ruled by the French in the mid-nineteenth century. 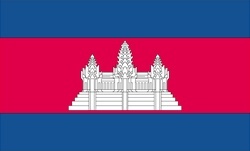 Its inhabitants know this country as "Kampuchea," and the French name for this country was "Cambodge," anglicized as the more commonly known Cambodia. The country's flag has changed over time. The current flag has been in use since 1993. The red color has also appeared in all the flags flown by Kampuchea of which we have records. The current design of the ensign displays three colors: blue, red and white. The temple is displayed in white on a red colored horizontal band. There are a total of three horizontal bands. The center red colored band has a blue band on both the top and bottom side. If interested in more information, click here.